A look at the lives and deaths of two of those who died on hunger strike in the struggle for Irish freedom, thirty years ago. The second republican to join the H-Block hunger-strike for political status - a fortnight after Bobby Sands - was twenty-five-year-old Francis Hughes, from Bellaghy in South Derry: a determined, committed and totally fearless IRA Volunteer who organised a spectacularly successful series of military operations before his capture, and was once described by the RUC as their ‘most wanted man’ in the North. Eluding for several years the relentless efforts of the British army, UDR and RUC to track him down, Francis operated boldly throughout parts of Tyrone and north and south Antrim, but particularly in his native South Derry, with a combination of brilliant organisation and extreme daring - until his capture after a shoot-out with the SAS - which earned him widespread popular renown, and won general support for the republican cause, as well as giving him an undisputed reputation as a natural-born soldier and leader. Francis Hughes was born on February 28th, 1956, the youngest son amongst ten children, into a staunchly republican family which has been solidly rooted, for most of this century, in the townland of Tamlaghtduff, or Scribe Road, as it is otherwise called. His parents who married in 1939, are Patrick Joseph Hughes, aged 72, a retired small cattle farmer born in the neighbouring town land of Ballymacpeake, and Margaret, aged 68, whose maiden name is McElwee, and who was born in Tamlaghtduff. A quarter-of-a-mile away from the Hughes’ bungalow, on the other side of the Scribe Road is the home of Thomas and Benedict McElwee - first cousins of Francis. Benedict is currently serving a sentence in the H-Blocks. Thomas - the eldest - embarked on hunger strike on June 8th, and died sixty-two days later on August 8th. In Tamlaghtduff, as throughout the rest of Bellaghy, sympathy as well as active support for the republican cause runs at a very high level, a fact testified to by the approximately twenty prisoners-of-war from around Bellaghy alone. Francis was an extremely popular person, both to his family and to his republican colleagues and supporters. It was qualities like these, of uncomplaining tirelessness, of consideration for the morale of those around him, and his ruling wish to lead by example, that have made Francis Hughes one of the most outstanding Irish revolutionary soldiers this war has produced and a man who was enormously respected in his native countryside. As a boy, Francis went first to St. Mary’s primary school in Bellaghy, and from there to Clady intermediate school three miles away. He enjoyed school and was a fairly good student whose favourite subjects were history and woodwork. He was not particularly interested in sport, but was very much a lively, outdoor person, who enjoyed messing around on bikes, and later on, in cars. He enjoyed dancing and regularly went to ceilidh as a young man, even while ‘on the run’, although after ‘wanted’ posters of him appeared his opportunities became less frequent. His parents recall that Francis was always extremely helpful around the house, and that he was a “good tractor man”. Leaving school at sixteen, Francis got a job with his sister Vera’s husband, as an apprentice painter and decorator, completing his apprenticeship shortly before ‘going on the run’. On one occasion, shortly after the ‘wanted’ posters of him had been posted up all over South Derry, Francis was painting window frames at the front of the house he was staying in when two jeep-loads of British soldiers drove past. While the other occupants of the house froze in apprehension, Francis waved and smiled at the curious Brits as they passed by, and continued painting. It was such utter fearlessness, and the ability to brazen his way through, that saved him time and time again during his relatively long career as an active service Volunteer. On one such occasion, when stopped along with two other Volunteers as they crossed a field, Francis told a Brit patrol that they didn’t feel safe walking the roads, as the IRA were so active in the area. The Brits allowed the trio to walk on, but after a few yards Francis ran back to the enemy patrol to scrounge a cigarette and a match from one of the British soldiers. A turning point for Francis, in terms of his personal involvement in the struggle, occurred at the age of seventeen, when he and a friend were stopped by British soldiers at Ardboe, in County Tyrone, as they returned from a dance one night. Notwithstanding such a bitter personal experience of British thuggery, and the mental and physical scars it left, Francis’ subsequent involvement in the Irish Republican Army was not based on a motive of revenge but on a clear and abiding belief in his country’s right to national freedom. During the early part of ‘the troubles’, the ‘Officials’ were relatively strong in the South Derry area and Francis’ first involvement was with them. However, disillusioned, as were many others, with the ‘Sticks’ unilateral ceasefire in 1972, he left to set up and command an ‘independent’ military unit in the Bellaghy area. About the end of 1973 the entire unit - including Francis - was formally recruited into the IRA. Francis’ involvement brought him increasingly to the attention of the British army and RUC and he was regularly held for a few hours in Magherafelt barracks and stopped on the road by British patrols; and on one occasion he was held for two days at Ballykelly camp. As the 1975 IRA/British army truce came to an end Francis, fearing his imminent arrest, went ‘on the run’. From that time on, he led a life perpetually on the move, often moving on foot up to twenty miles during one night then sleeping during the day - either in fields and ditches or in safe houses; a soldierly sight in his black beret and combat uniform, and openly carrying his rifle, a handgun and several grenades as well as food rations. The enemy reacted with up to fifty early morning raids on Francis’ home, and raids on the homes of those suspected of harbouring him. Often, houses would be staked out for days on end in the hope of capturing Francis. Often, it was only his sheer nerve and courage which saved him. One night, Francis was followed to a ‘safe house’ and looked out to see the Brits surrounding the place and closing in. Without hesitating, the uniformed Francis stepped outside the door, clutching his rifle, and in the darkness crept gradually through their lines, occasionally mumbling a few short words to British soldiers he passed, who, on seeing the shadowy uniformed figure, mistook him for one of themselves. On numerous occasions, Francis and his comrades were stopped at checkpoints along the country roads while moving weapons from one locality to another but always calmly talked their way through. Once, a UDR soldier actually recognised Francis and his fellow Volunteers in a car but, fully aware that Francis would not be taken without a shoot-out, he waved their car on. The years before Francis’ capture were extremely active ones in the South Derry and surrounding areas with the commercial centres of towns and villages like Bellaghy, Maghera, Toome, Magherafelt and Castledawson being blitzed by car bombs on several occasions, and numerous shooting attacks being carried out as well. Among the Volunteers under his command Francis had a reputation of being a strict disciplinarian and perfectionist who could not tolerate people taking their republican duties less seriously, and selflessly, than was necessary. He also, however, inspired fellow Volunteers by his example and by always being in the thick of things, and he thrived on pressure. During one night-time operation, a weapon was missing and Francis gave away his own weapon to another Volunteer, taking only a torch himself which he used to its maximum effect by shining it at an oncoming enemy vehicle, which had its headlights off, to enable the other Volunteers to direct their fire. Francis’ good-humoured audacity also showed itself in his republican activity. At the height of his ‘notoriety’ he would set up road-blocks, hoping to lure the Brits into an ambush (which by hard experience they learned to avoid), or he would ring up the Brits and give them his whereabouts! Such joking, however, did not extend only to the enemy. One day, lying out in the fields, he spied one of his uncles cycling down a country road. Taking careful aim with his rifle he shot away the bike’s rear wheel. His uncle ran alarmed, into a nearby house shouting that loyalists had just tried to assassinate him! The determination of the British army and RUC to capture Francis Hughes came to a head in April 1977. In that month, on Good Friday, a car containing three IRA Volunteers was overtaken and flagged down on the Moneymore Road at Dunronan, in County Derry, by a carload of RUC men. The Volunteers attempted to make a U-turn but their car got stuck in a ditch as the armed RUC men approached. Jumping from the car, the Volunteers opened fire, killing two RUC men and injuring another before driving off. A hundred yards further up the road a second gun battle ensued but the Volunteers escaped safely. 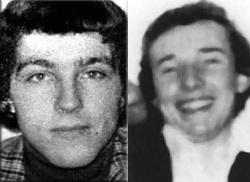 Subsequently, the RUC issued a ‘wanted’ poster of Francis Hughes and two fellow republicans, Dominic McGlinchey and Ian Milne, in which Francis was named as the ‘most wanted man’ in the North. One of the pair, in fact, was Francis Hughes, the other a fellow Volunteer, and with only a second’s hesitation both Volunteers cocked their rifles and opened fire. One SAS man fell fatally wounded but the other - though shot in the stomach - managed to fire a long burst from his sterling sub-machine gun at the retreating figures, and to make radio contact with his base. How he survived the night of the shooting, possibly the coldest night of that year, bears eloquent testimony to Francis’ grim determination to evade capture. After being shot, he dragged himself - unable to walk - across the Ronaghan road and across two fields without a sound, before burying himself in a thick clump of gorse bushes. At one point, en-route, Francis fell down a sharp drop between fields, and his left leg - the muscle and bone completely disintegrated - came up over his shoulder; but Francis worked it carefully down before continuing to crawl on his way. In his hiding place, he lay through the night, motionless and soundless, till his capture. When he was found, unable to move through the cold, pain and stiffness, Francis, knowing that both Brits and RUC were on instructions to shoot him on sight, gave his name as Eamonn Laverty and his address as Letterkenny, County Donegal. Francis was taken to Magherafelt hospital and from there to Musgrave Park military hospital in Belfast, and it was only then that his true identity was revealed. He spent ten months in Musgrave Park where his leg was operated on, reducing his thigh bone by an inch-and-a-half and leaving him dependent on a crutch to walk. On Wednesday, January 24th, 1979, Francis was taken from Musgrave Park hospital to Castlereagh interrogation centre where he spent six days before being charged on January 29th. For more than four days Francis refused food and drink, fearing that it might have been drugged to make him talk. His behaviour in Castlereagh was typical of the fiercely determined and courageous republican Volunteer that he was. His frustrated interrogators later described him as “totally uncooperative”. Nevertheless, at his trial in Belfast in February 1980, after a year on remand in Crumlin Road jail, Francis was found ‘guilty’ on all charges. He received a life sentence for killing the SAS soldier, and fourteen years for attempting to kill the other SAS man. He also received fifty-five years on three other charges. In the H-Blocks, Francis immediately went on the protest for political status and, despite the severe disability of his wounded leg, displayed the same courage and determination that had been his hallmark before his capture. And, just as always wanting to be in the thick of things and wanting to shoulder responsibility for other political prisoners as he had earlier looked after the morale of fellow Volunteers, Francis was one of those to volunteer for the hunger strike which began on October 27th, 1980. He was not one of the first seven hunger strikers selected but was among the thirty men who joined the hunger strike in its closing stages as Sean McKenna’s condition became critical. That utter selflessness and courage came to its tragic conclusion on Tuesday, May 12th, when Francis died at 5.43 p.m. after fifty-nine days on hunger strike. The third of the resolutely determined IRA Volunteers to join the H-Block hunger strike for political status was twenty-four-year-old Raymond McCreesh, from Camlough in South Armagh: a quiet, shy and good-humoured republican, who although captured at the early age of nineteen, along with two other Volunteers in a British army ambush, had already almost three years active republican involvement behind him. During those years he had established himself as one of the most dedicated and invaluable republican activists in that part of the six counties to which the Brits themselves have - half-fearfully, half-respectfully - given the name ‘bandit country’ and which has become a living legend in republican circles, during the present war, for the courage and resourcefulness of its Volunteers: the border land of South Armagh. Captured in June 1976, and sentenced in March 1977, when he refused to recognise the court, Raymond would have been due for release in about two years’ time had he not embarked on his principled protest for political status, which led him, ultimately, to hunger strike. Raymond Peter McCreesh, the seventh in a family of eight children, was born in a small semi-detached house at St. Malachy’s Park, Camlough - where the family still live - on February 25th, 1957. The McCreeshes, a nationalist family in a staunchly nationalist area, have been rooted in South Armagh for seven generations, and both Raymond’s parents - James aged 65, a retired local council worker, and Susan (whose maiden name is Quigley), aged 60 - come from the nearby townland of Dorsey. Raymond was a quiet but very lively person, very good-natured and - like other members of his family - extremely witty. Not the sort of person who would push himself forward if he was in a crowd, and indeed often rather a shy person in his personal relationships until he got to know a person well. Nevertheless, in his republican capacity he was known as a capable, dedicated and totally committed Volunteer who could show leadership and aggression where necessary. Raymond went first to Camlough primary school, and then to St. Coleman’s college in Newry. It was at St. Coleman’s that Raymond met Danny McGuinness, also from Camlough, and the two became steadfast friends. They later became republican comrades, and Danny too then a nineteen-year-old student who had just completed his ‘A’ levels was captured along with Raymond and Paddy Quinn, and is now in the H-Blocks. At school, Raymond’s strongest interest was in Irish language and Irish history, and he read widely in those subjects. His understanding of Irish history led him to a fervently nationalist outlook, and he was regarded as a ‘hothead’ in his history classes, and as being generally “very conscious of his Irishness”. He was also a sportsman, and played under-sixteen and Minor football for Carrickcruppin Gaelic football club as well as taking a keen interest in the local youth club where he played basketball and pool, and was regarded a good snooker player. When he was fourteen years old, Raymond got a weekend job working on a milk round through the South Armagh border area, around Mullaghbawn and Dromintee. Later on, after leaving his job in Lisburn, he worked full-time on the milk round, where he would always stop and chat to customers. He became a great favourite amongst them and many enquired about him long after he left the round. During the early ‘seventies, the South Armagh border area was the stamping ground of the British army’s Parachute regiment, operating out of Bessbrook camp less than two miles from Raymond’s home. Stories of their widespread brutality and harassment of local people abound, and built-up then a degree of resentment and resistance amongst most of the nationalist population that is seen to this day. The SAS terror regiment began operating in this area in large numbers too, in a vain attempt to counter republican successes, and the high level of assassinations of local people on both sides of the South Armagh border, notably three members of the Reavey family in 1975, was believed locally to have been the work both of the SAS, and of UDR and RUC members holding dual membership with ‘illegal’ loyalist paramilitary organisations. Given this scenario and Raymond’s understanding of Irish history, it is small wonder that he became involved in the republican struggle. He first of all joined na Fianna Eireann early in 1973 and towards the end of that year joined the Irish Republican Army’s 1st Battalion, South Armagh. Even before joining the IRA, and despite his very young age, Raymond - with remarkable awareness and maturity - became one of the first Volunteers in the South Armagh area to adopt a very low, security conscious, republican profile. He rarely drank, but if occasionally in a pub he would not discuss either politics or his own activities, and he rarely attended demonstrations or indeed anything which would have brought him to the attention of the enemy. It was because of this remarkable self-discipline and discretion that during his years of intense republican involvement Raymond was never once arrested or even held for screening in the North, and only twice held briefly in the South. Consequently, Raymond was never obliged to go ‘on the run’, continuing to live at home until the evening of his capture, and always careful not to cause his family any concern or alarm. Fitted in with his republican activities Raymond would relax by going to dances or by going to watch football matches at weekends. After leaving school he spent a year at Newry technical college studying fabrication engineering, and afterwards got a job at Gambler Simms (Steel) Ltd. in Lisburn. He had a conscientious approach to his craft but was obliged to leave after a year because of a fear of assassination. Each day he travelled to work from Newry, in a bus along with four or five mates who had got jobs there too from the technical college, but the prevailing high level of sectarian assassinations, and the suspicion justifiably felt of the predominantly loyalist work-force at Gambler Simms, made Raymond, and many other nationalist workers, decide that travelling such a regular route through loyalist country side was simply too risky. So, after leaving the Lisburn factory, Raymond began to work full-time as a milk roundsman, an occupation which would greatly have increased his knowledge of the surrounding countryside, as well as enabling him to observe the movements of British army patrols and any other untoward activity in the area. Republican activity in that area during those years consisted largely of landmine attacks and ambushes on enemy patrols. Raymond had the reputation of a republican who was very keen to suggest and take part in operations, almost invariably working in his own, extremely tight, active service unit, though occasionally, when requested - as he frequently was - assisting other units in neighbouring areas with specific operations. He would always carefully consider the pros and cons of any operation, and would never panic or lose his nerve. In undertaking the hunger strike, Raymond gave the matter the same careful consideration he would have expended on a military operation, he undertook nothing either a rush, or for bluff. The operation which led to the capture of Raymond, his boyhood friend, Danny McGuiness, and Patrick Quinn, took place on June 25th, 1976. An active service unit comprising these three and a fourth Volunteer arrived in a commandeered car at a farmyard in the town land of Sturgan a mile from Camlough - at about 9.25 p.m.
Their objective was to ambush a covert Brit observation post which they had located opposite the Mountain House Inn, on the main Newry - Newtonhamilton Road, half-a-mile away. They were not aware, however, that another covert British observation post, on a steep hillside half-a-mile away, had already spotted the four masked, uniformed and armed Volunteers, clearly visible below them, and that radioed helicopter reinforcements were already closing in. As the fourth Volunteer drove the commandeered car down the road to the agreed ambush point, to act as a lure for the Brits, the other three moved down the hedgeline of the fields, into position. The fourth Volunteer, however, as he returned, as arranged, to rejoin his comrades, spotted the British Paratroopers on the hillside closing in on his unsuspecting friends and, although armed only with a short range Stengun, opened fire to warn the others. Immediately, the Brits opened fire with SLRs and light machine-guns, churning up the ground around the Volunteers with hundreds of rounds, firing indiscriminately into the nearby farmhouse and two vehicles parked outside, and killing a grazing cow! The fourth Volunteer was struck by three bullets, in the leg, arm and chest, but managed to crawl away and to elude the massive follow up search, escaping safely - though seriously injured - the following day. Raymond and Paddy Quinn ran zig-zag across open fields to a nearby house, under fire all this time, intending to commandeer a car. Unfortunately, the car belonging to the occupants of the house was parked at a neighbour’s house several hundred yards away. Even then the pair might have escaped but that they delayed several minutes waiting for their comrade, Danny McGuinness, who however had got separated from them and had taken cover in a disused quarry outhouse (where he was captured in a follow-up operation the next day). The house in which Raymond and Paddy took cover was immediately besieged by berserk Paratroopers who riddled the house with bullets. Even when the two Volunteers surrendered, after the arrival of a local priest, and came out through the front door with their hands up, the Paras opened fire again and the Pair were forced to retreat back into the house. On the arrival of the RUC, the two Volunteers again surrendered and were taken to Bessbrook barracks where they were questioned and beaten for three days before being charged. One remarkable aspect of the British ambush concerns the role of Lance-Corporal David Jones, a member of the 3rd Battalion, the Parachute regiment. According to Brit statements at the trial it was he who first opened up on the IRA active service unit from the hillside. Nine months later, on March 16th, 1977 two IRA Volunteers encountered two Paratroopers (at the time seconded to the SAS) in a field outside Maghera in South Derry. In the ensuing gun battle, one SAS man was shot dead, and one IRA Volunteer was captured. The Volunteer’s name was Francis Hughes, the dead Brit was Lance-Corporal David Jones of the Parachute regiment. In the eighteen months before going on hunger strike together neither Raymond McCreesh or Francis Hughes were aware of what would seem to have been an ironic but supremely fitting example of republican solidarity! After nine months remand in Crumlin Road jail, Raymond was tried and convicted in March 1977, of attempting to kill Brits, possession of a Garand rifle and ammunition, and IRA membership. He received a fourteen-year sentence, and lesser concurrent sentences, after refusing to recognise the court. In the H-Blocks he immediately joined the blanket protest, and so determined was his resistance to criminalisation that he refused to take his monthly visits for four years, right up until he informed his family of his decision to go on hunger strike on February 15th, this year. He also refused to send out monthly letters, writing only smuggled ‘communications’ to his family and friends. The only member of his family to see him at all during those four years in Long Kesh two or three times - was his brother, Fr. Brian McCreesh, who occasionally says Mass in the H-Blocks. Like Francis Hughes, Raymond volunteered for the earlier hunger strike, and, when he was not chosen among the first seven, took part in the four-day hunger strike by thirty republicans until the hunger strike ended on December 18th, last year. Speaking to his brother, Malachy, shortly after Bobby Sands death, Raymond said what a great loss had been felt by the other hunger strikers, but it had made them more determined than ever. To Britain’s eternal shame, the sombre half-prediction made by Raymond to his friend Paddy Quinn - Ta seans ann go mbeid me abhaile rombat - became a grim reality. Bhi se. Raymond died at 2.11 a.m. on Thursday May 21st, 1981, after 61 days on hunger strike.